Poker Grump: The tournament is on! The second Poker Grump readers' tournament is now set. 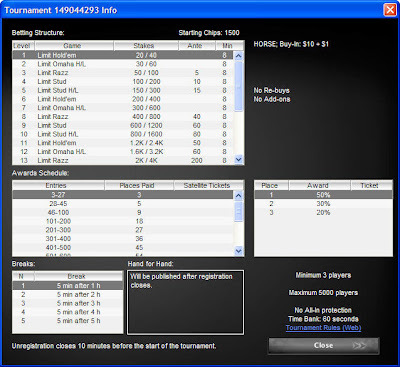 It will be held on PokerStars, Monday, April 27, at 21:15 EDT. It will be HORSE (limit), with structure and prizes as shown above. Password is "grumpy" (case-sensitive). I realize that the game, the buy-in, the date, the time, the site, and every other variable will not be to the liking of all--but then, no possible combination could be. Stars makes it easy to fund an account, if you don't already have money there. The "Instant e-check deposit" option can take the funds directly from your checking account, no muss, no fuss. If for whatever reason you can't get money onto the site in any other reasonable way, and you'd like to play, I will do exchanges as needed. Email me (see the profile in the left column for the address). We can do an equivalent trade (i.e., $11) on Full Tilt or via PayPal. You will, I hope, understand that in order to prevent being scammed by making an open offer like this, I'll ask you to make your end of the exchange first. I'll make the next one NLHE again. Incidentally, I like how Stars makes it easy to set up private tournaments. I hadn't tried it before. You email them, they review your history on the site. If they judge that you've played enough (I have no idea what the exact criteria might be, but I think they just want to be sure that you didn't sign up exclusively for setting up a private tourney), they enable a new feature on your client software. Under "requests" in the main lobby, there then appears the menu for creating a private tournament. It doesn't give some of the options available on Full Tilt, such as deep stacks or bounties, but, on the other hand, you can do it all yourself, rather than exchanging emails with somebody in customer service to do it for you. Ooh HORSE. Mmmm, that might convince me to try and make it. I've got my $11 ready and will try to make the tourny. Any chance we can do it on Full Tilt next time? I really hate the Stars interface.... but that's just me. As I said, it's impossible to please everyone. The previous one was on Full Tilt, so I thought it reasonable to move this one to Stars. There must be just as many people who have an account on one but not the other. Also, Stars has a better structure for HORSE--at least for STTs. I didn't check it for MTTs. And, though it's completely a matter of taste, I prefer the Stars interface. I dislike the cartoons on FTP. But yeah, it's likely that I'll go back to FTP for whenever #3 will be, just to keep things more or less even. Hope there are enough seats. I hope the 5000 max entrants doesn't get full. I'll be registered as soon as I'm sure I can make it that day. I am an old man, so if you can put reminders out there occasionally, I would like to join in. Signed up, can't wait. Thanks for setting it up. 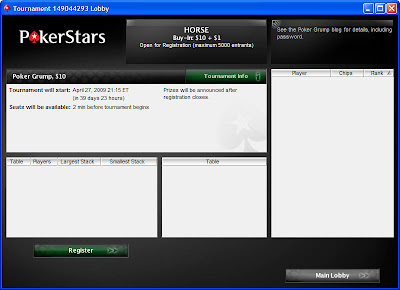 We just did a private $5 HORSE on PokerStars as part of the Poker Soup podcast. Frankly, the structure was horrible. Poker Stars' HORSE sit-n-go had better structure than what we ended up with. You might want to check it out and see if they structure compares favorably. We played 8 min levels (10 mins for a sng) and a fast blind structure. The 16 player event lasted a mere 1:15. I'm pretty sure I've played a one table HORSE sng that lasted nearly as long.